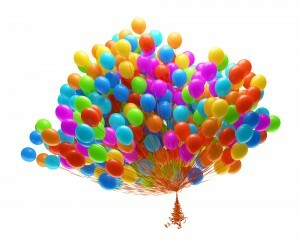 Balloons are famous for their variety of colours and shapes. Any joyful event can be supported by a great number of colourful balloons to make it even more festive. Balloons just scream festiveness! Festivity comes out of them like invisible sparks of joy that are spread throughout a crowd. Seeing all those different shades of balloons tied together and forming a variegated bundle can bring your smile back in a second. A common fact is that colours can make a gray day more fun, so why not spice up someone’s daily grind with balloons? Flower Shops has them in every hue and shape, and we are always ready to take part in your ‘spread the smiles’ project. With balloons you can express all kinds of happy emotions. They can be given by themselves or combined with flowers and other presents. Adding balloons and flowers to your gift can make it look more special and impressive, and giving this combination means that you’ve tried hard because you care. It won’t be an exaggeration if we say that balloons are mandatory for birthday parties as part of the decoration or the present. They can really change the atmosphere of a place and add a little bit of colour here and there. And with all that balloons can invite the happy mood in. It’s not unusual to give only one balloon on a cord just because you felt like doing it for a friend, a family member or a loved one without any occasion. We can offer you something special – a printed message on your balloon that can say everything for you. It can be a regular one, such as ‘I love you’ or ‘Thank you’, or a funny one like ‘Let’s be weird together’. Our company gives you a great variety of messages to choose from. We also have balloons in all kinds of shapes – the regular oval ones, the popular heart-shaped ones, etc. 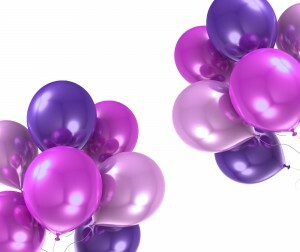 Our Mylar balloons give the possibility of even more variety of shapes and prints. We have balloons with cartoon characters printed on them, which are popular amongst children. Balloons made of Mylar allow a great freedom of shapes. Absolutely everything can be printed on such a balloon – a tiger, a bunny, a princess or a car, and the colours are vivid and eye-catching. This type of balloon can be the perfect addition to a present for a child’s birthday, especially if you know what the kid likes at the moment. A wedding is an occasion that also requires the presence of balloons since it’s another festive event. Here our specialists can let their fancy roam! Their imagination lets them think of unique designs made of regular balloons. A popular thing at a wedding is the newly married couple to be showered in balloons that fall down from the ceiling during their first dance. That’s something we can make happen for your special day. Another one that’s usually used is the arch of balloons. The good thing about balloons here is that they can match the wedding colour scheme. Balloons can be manipulated in such a way that they can be made to look like a flower bouquet. The skills of our gifted balloon experts are endless, so you can rest assured that they will be able to fulfill your order. So, if we have to sum up, balloons are the gifts that can cheer people up or the ones that are part of every joyful event. Flower Shops is the one that can assist with their delivery for whatever occasion they’re intended for. Ring us up on ‎020 3900 2440 to see for yourself what a great experience it will be to work with our well-prepared and helpful staff.